Background is on (wedges not stitched together–awaiting center hexagon fix). I should have unfolded the fabric and laid the slices on it before I cut it but of course I was in too much of a hurry for that. After I got it cut, I thought I should have used one of the darker colors as background. But I laid those down and didn’t like any of them better so–the apt slogan for this quilt–ONWARD! There is one problem that has to be remedied first. The wedgie in the 8 o’clock position doesn’t have enough orange in it so it keeps drawing my eye like the wart on a witch’s nose. It will be replaced. It’s somewhat of a sickness I know. But while I’ve learned to let a lot of things go, I’ve also learned to recognize things that will drive me nuts down the road. Better to fix it now and avoid extra mental stress. Why did I wait to change it till it was already stitched, you ask? Frugal me thought she could win over Perfection me. She should have known better. I have already cut the new piece. 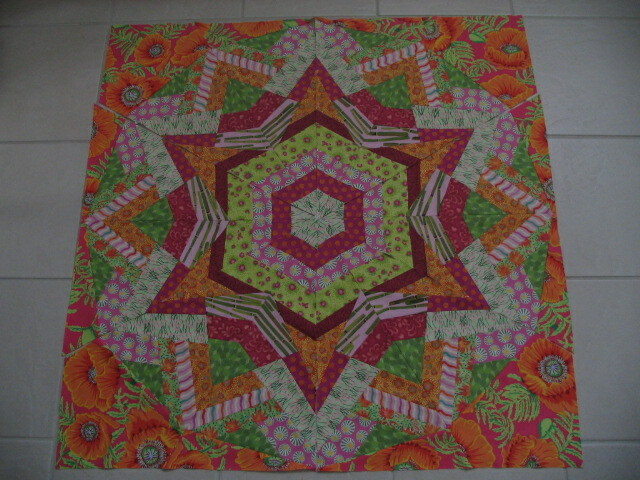 This entry was posted in kaleidoscope quilt, quilting and tagged kaleidoscope quilt, quilting. Bookmark the permalink. Haha. I think you are too hard on yourself! I can’t see what you are talking about in wedge 8. The whole thing looks beautiful to me. I can see where you would second guess the background fabric, but I really like it. It gives the feeling of the center raditating even further, beautiful effect. Such a battle between Perfection and Frugal. Like comic book heros, the wins and loses seem to alternate. I’m with the gang on this. Cannot see what the problem is at 8 o’clock. Get frugal self to talk to perfectionist self. Replacing the piece may lead to other piecing problems. Sorry, I forgot to mention how great this is. I like the background – you can still see the complex pattern. It looks good to me. I also had to enlarge the photo and look carefully to see what piece you were talking about and it still looked okay to me. Oh, Carol! This is lovely, lively, and fun! I agree with you–if you see the wart, it diminishes the process and product for you. Maybe it’s not so much about “perfection” as it is about excellence in craft-womanship, something you embody! Onward indeed! It is beautiful!!! I really love the orange fabric. Hasn’t this been fun. I’m sure glad that all these commenters before me couldn’t find the 8 o’clock problem either. I would’ve blamed it on my scratched cornea. My nincompoop theory of the day is that people that quilt all have a little of the obsessive compulsive about them. It’s a constant battle between the good and evil forces of perfection, hoarding, and frugality. Keeps me on my toes. Keep it fun and move onward…Your quilt is beautiful! This is a wonderful quilt! I can only imagine the wonderful kaleidoscopic images this sleep-aid would bring wafting into the dream space. And, re: 8th wedge, to paraphrase those wonderfully wise zen philosophers , “Within perfection, there is always a particle of imperfection.” (Otherwise, the item is incomplete, since imperfection is part of the wholeness of the perfect universe.) Groove On, Quiltfever Girl.